Statistics for 2016 now out! Cricket: France-England rematch in 2012, in Lille ? France Flanders win EuroTwenty20 tournament! ICC World Twenty20 live online on Eurosport!!! LCC President Tony Banton new President of France Cricket! No French farce as Rosbifs are cooked! The FRANCE FLANDRES cricket team take on Europe! This year, LCC will be celebrating its 10th anniversary. To mark the occasion, our Social Media Community Manager, Maxime Parent, has produced a video recap of some of the highlights of the last decade. Follow LCC of Facebook and Twitter! 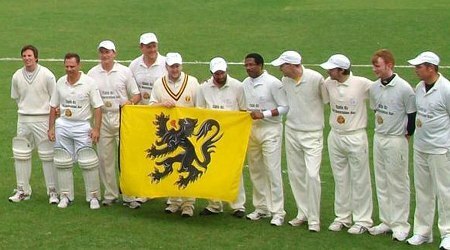 In a year when research revealed that cricket could have been invented by the Flemish it was perhaps fitting that Flanders were the winners of the second Carmel EuroTwenty20 tournament staged in North Wales.